Within the same shot, you can spread the current layer motion across all panels or a specified number of panels after the current panel. 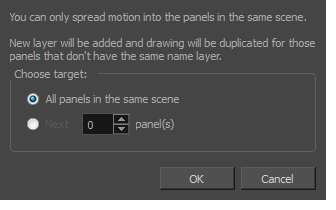 A new layer will be added and the drawing will be duplicated for panels that do not have the same name in the defined range. ‣ In the Layer toolbar, click the Spread Layer Motion button. You may have to add this button to the Layer toolbar by customizing it. To spread layer motion over all panels in the same shot, select the All panels in the same shot option. To spread layer motion a specified number of panels after the current panel in the same shot, select Next panel(s) and enter or select the number of adjacent panels.